Have you considered a bungee launch to get her up to speed quickly? Left battery pod totally off - I must remember to return that divot to the field. There is a crack in the left pylon at the v-tail. Right pylon totally off, just held on with the wires. All of this is repairable I think. Looking at this in slow-mo I am beginning to thing that this is just a lack of power problem (oh, and I could have tried a little harder, the throw seems a little timid). I would try moving the CG back a bit and see where that gets you. Yep - although I like to maiden nose heavy, I may have overdone it this time. On the thrust angle, this is a profile pic marking the supposed thrust line from the EDF (horizontal line) and the CG position, which is essentially where I am gripping the model for launch. I would not expect to be able to feel "push over" from the EDF with this setup which I why I suspect that the EDF and thrust tube could be off, with the thrust exiting the tube pointing downward, creating a torque around the CG. But looking at the vid of the second launch, I may be imagining this because the plane didn't look like it was nosing down significantly. Yep - this could be a good option - lack of launch speed is probably killing any attempt to get her up. Only concern is that once up, if I am still significantly underpowered, then I just come down again. What is the next step to make this fly? (c) Remove the EDF and add a single pusher to the rear ( the E-Flite Motor 10 that I run on the Tigercat will give me just under 4.5 lbs thrust on 3S with a 12x4 prop). It also might be worth my while, if I pull the EDF, to do some glide testing. About the pushover. I had the same feel on launching the Quinjet but it turned out to be of no consequence. On that model my EDFs are above center line a lot and are still zero thrust angle, so I did expect it but it did not nose over at all. I don’t think that looks like an issue for you either. Seems to me a ground/bungee start to get airspeed, or more power is needed. A higher lift airfoil may help or possibly flaps to increase camber until you are up to speed. That is a sound plan. Same with the prop power. Looking at the launch, it looked like it may have yaw'd a bit from the toss. I agree that it does not look to be a thrust angle nose down, I would say the issue is the awkwardness of the grip. I also agree that having a better T2WR, it probably would have powered out of that. Not a bad toss, just not enough thrust combined with an awkward grip. Build post is complete (what a job that was, its a bit of a slog to read through, sorry). Haven't made much progress with the plane. I did pull the EDF because the next version will be prop powered. Not overly happy with this option as I think the props will not really fit the look of the plane. One option is twin props at the front of the battery pods - this might give me the option to mount the battery in the fuse instead of in the pods and, if I can keep it to 1 x 2200mAh 4S, this will save 1/2 pound. Second option is a single powerful pusher. I have the motors and props for this, but I might have trouble getting the plane to balance if I hang a large motor on the rear end. I'll do some mockups once I fix the airframe. So the 11 x 6 is really tempting at almost 5.5 pounds but I am going to have to check what the prop overhang at the back will be. I think she will still be a handful to launch and if I can avoid ripping my knuckles to shreds with the pusher prop that would be nice. Also considering a couple of fins attached to the underside of the tail that would hit the back of my hand before the prop does. 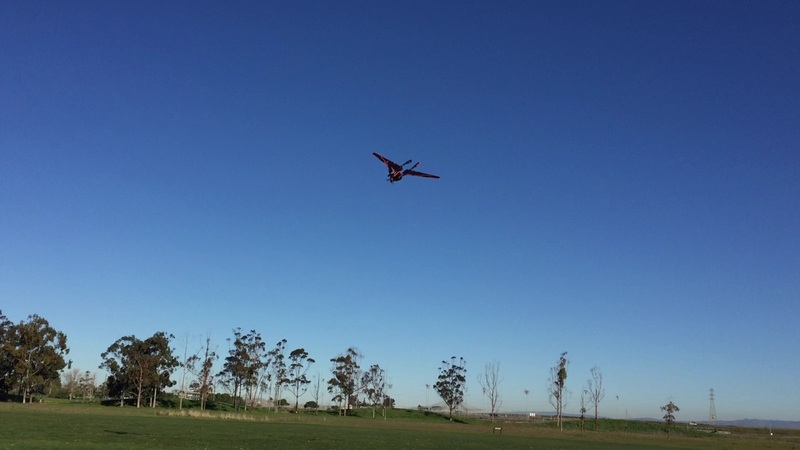 So, maiden flight - take 3 this weekend? Is it a bird? Is it a plane? Is it a Tron Legacy Light Jet flying? Well, actually, no, its not. So there it is. She's done. 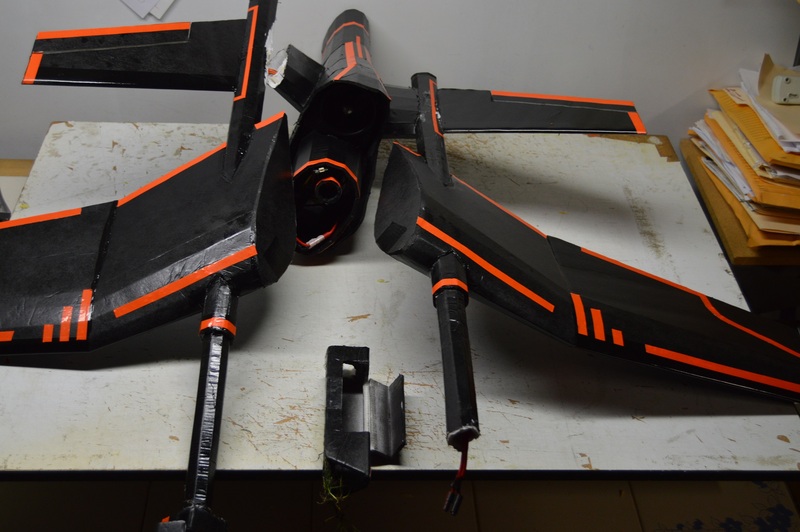 I will not attempt to fix this but I have learned a lot and think that I can still build a viable model of this plane - this time cutting down many carbon fiber trees to use the branches in the build. There will be a tragic montage video (design, build, crash, crash again) but beyond that I believe that this entry is complete. @rockyboy - if its okay with you, I will not be finalizing and posting the plans for this for the entry as I couldn't in good conscience encourage anyone to try this version. Maybe the next one. That first picture is awesome! She looks so majestic in the air! Seriously though - great looking build and a whole lot of learning - well done sir! I think I will skip finalizing the video production given that its mostly designing and building a plane that never flew. 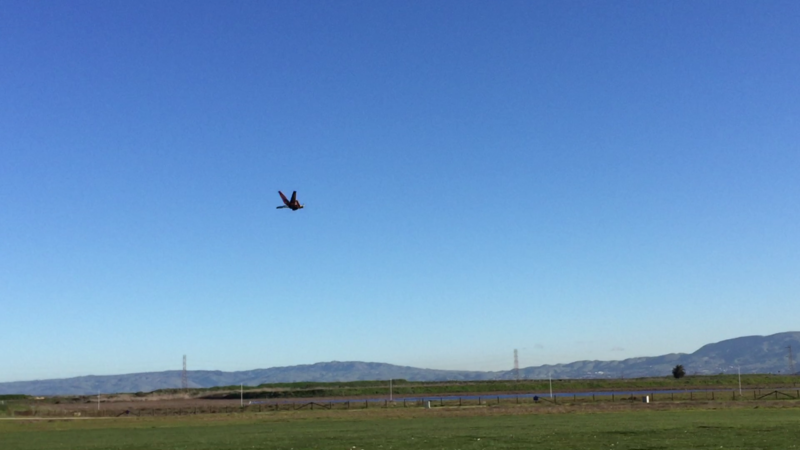 Instead, I post this gif as my "proof of flight" video. It may not have flown very well, but what it lacks in flight performance it makes up in style. Ditto ! Great build !